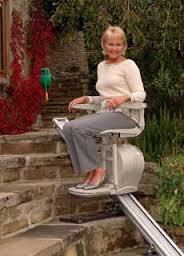 We have a lot of people call and ask questions about stair lifts. Below are the top ten questions and answers on stair lifts or what some people call chair lifts. Either way you say it, it doesn't matter. Hopefully this is helpful and All Star Medical can help you up or a loved one get up and down the stairs safer. How does the stair lift mount to my stairs? Answer: All of the electrical wires are inside the track with one wire that comes out and plugs into a regular 3 prong wall outlet. 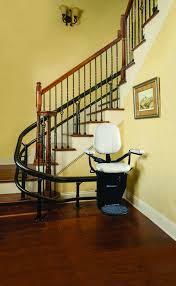 What if you have an obstruction or doorway at the bottom of the steps, Can you still get a stair lift installed? Answer: Yes, Most stair lifts have a hinge on the track that can be raised up or down so you can have a clear walkway or open a door fully when needed. Answer: Your stairs can be as small as 26 inches wide and still work. In most cases it is no problem if your stairs are 32 inches or wider. That's why its a good idea for us to come out on one of our free home assessments to see what we can do to make your like easier. What if my stairs have a curve or angle in them? Answer: That typically requires a curved stair lift which takes longer to manufacture and is much more expensive. Sometimes you can install two straight stair lifts cheaper than you can one curved stair lift. Answer: Yes. You have battery backups for situations like this and they typically have 10-12 lifts in them until power is brought back on. Answer: When in use it is around 24-25 inches and when it is not in use and folded up it is around 13 inches. If we didn't answer your question give us a call at 615-730-9438 or 615-567-6116 so we can get you the answers you need.